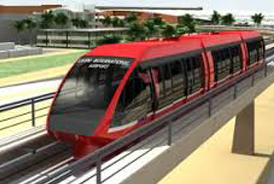 Cairo Airport Automated People Mover is the first of its kind in the Middle East, equipped with the latest and highest technology the industry can provide. 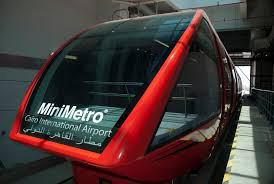 The Train was built for free service in the airport for the transit passengers and the general public to use within the airport grounds to connect from TB1 (Terminal 1), Air Mall, Car Park, TB2 (Terminal 2), until TB3 (Terminal 3) within 5 minutes maximum . The train's route length is 1857 meters. The Capacity of the train is 2000 Passengers per hour per direction. The number of trains in the service is 2 trains, and the number of vehicles in each train is 3 vehicles, the number of passengers 170 passengers and operating time 18 hours a day, and six hours of maintenance. This project is considered one of the largest civil projects implemented at the international airports after the construction of the TB 3 terminal with the latest technology in the world. Therefore, the project of the automatic people mover is a technological addition to this airport, which Egypt entered the world of advanced airports, and this train exists only in a few airports in the United States, France, Switzerland, Japan and Mexico. Thus, the vice president of the implementing company Bernard Schocker, who explained that this train is moving electronically on a kind of pillows and not on wheels and is using computer without human intervention. The video illustrates the Air-side and Land-side, The Airside is mainly for transit passengers passing from one terminal to another without going through customs as they are still in the transit area. As for the Land-side, it is mainly for the general public to use to move freely within the airport. All trains and stations were also provided with various fire alarm systems and emergency exits to ensure the safety and security of passengers with trains, stations and along routes.